republish or reproduce any part of this website through the use of iframes or screen-scrapers. Where content is specifically made available for redistribution, it may only be redistributed within your organization. You must not use this website for any purposes related to marketing without the express written consent of Cerise Fine Catering. Access to certain areas of this website is restricted to maintain site integrity. 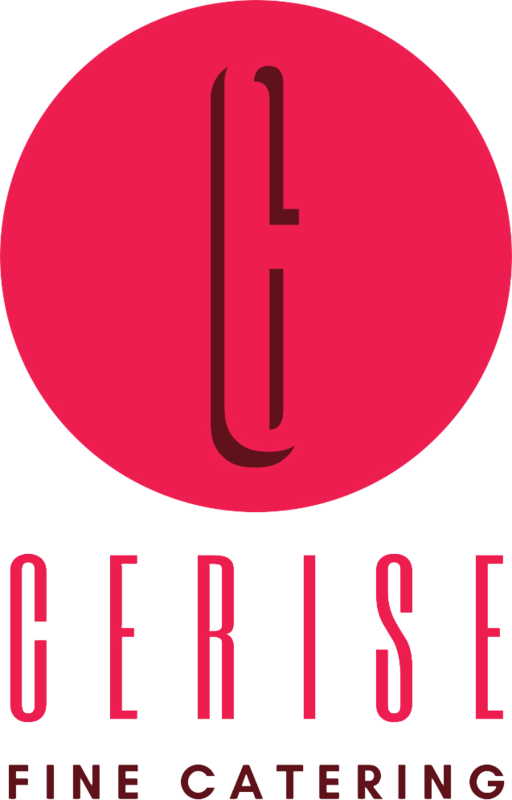 Cerise Fine Catering reserves the right to restrict access to certain areas of this website, or at our discretion, this entire website. Cerise Fine Catering may change or modify this policy without notice. If provides you with a user ID and password to enable you to access restricted areas of this website or other content or services, you must ensure that the user ID and password are kept confidential. You alone are responsible for your password and user ID security. Cerise Fine Catering may disable your user ID and password at sole discretion without notice or explanation. You grant to a worldwide, irrevocable, non-exclusive, royalty-free license to use, reproduce, adapt, publish, translate and distribute your user content in any existing or future media. You also grant to the right to sub-license these rights, and the right to bring an action for infringement of these rights. Your user content must not be illegal or unlawful, must not infringe any third party’s legal rights, and must not be capable of giving rise to legal action whether against you or or a third party (in each case under any applicable law). This website is provided “as is” without any representations or warranties, express or implied. Cerise Fine Catering makes no representations or warranties in relation to this website or the information and materials provided on this website. Without prejudice to the generality of the foregoing paragraph, does not warrant that: this website will be constantly available, or available at all; or the information on this website is complete, true, accurate or non-misleading. Cerise Fine Catering, shall never knowingly sell or distribute client information or information collected through their websites. Customers shall not use Cerise Fine Catering, network in an attempt to circumvent user authentication or security of any host, network, or account. Cerise Fine Catering, will fully cooperate with investigations of violations of systems or network security. This also includes cooperating with law enforcement authorities in the investigation of suspected criminal violations. Users who violate system or network security may incur criminal or civil liability. The full name of cerisefinecatering.com is Cerise Fine Catering.